Elmhurst Hospital Prison Ward is located in Queens New York. It is where female inmates go if they require psychiatric care for acute mental illness. 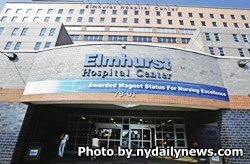 This is a secure ward within the Elmhurst City Hospital. Visitation days are decided using the first letter of the inmate's last name. Check the current visiting schedule here for the days you are allowed to visit. No visiting occurs on Mondays or Tuesdays. Wednesday and Thursday visitation registration occurs between 1pm and 8pm, visits last until 9pm. Friday, Saturday, and Sunday visitation occurs from 8am-4pm, registration for visiting is from 7am-2pm.